Detects cap loss / hose burst / water off in resistance welding circuits, thus assures quality welds. Monitors robotic cells, pedestal welders or multiple work cells. Deltapoint® detects leaks from cap loss, hose burst or inadvertent shutoff. Monitoring robotic cells, pedestal welders or multiple work cells. Water is shut down to stop the leak and a signal is sent to the controller. The flow sensors have no moving parts to be affected by entrained contaminants. The only mechanical parts are the shut off and check valves. User Programmable: Leak rate alarm, response time, restart delay, Flow OK level, temperature fault level and minimum flow monitoring. The DPL Drawback Air Cylinder activates during cap loss, creating a vacuum and allowing for zero water on the plant floor. 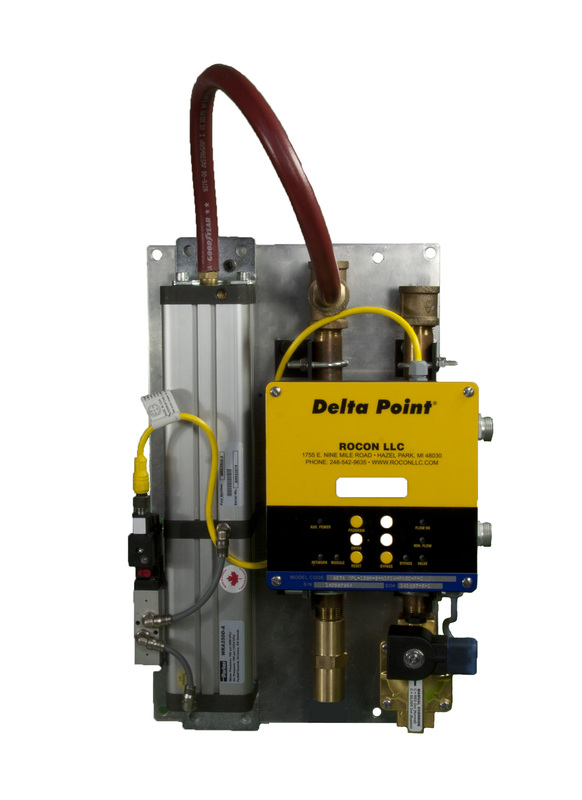 Deltapoint Jr®, detects cap loss / hose burst / water off in resistance welding circuits, thus assures quality welds. Monitoring robotic cells, pedestal welders or multiple work cells via vortex flow sensor in the return line from the cell, shutting water off and sending alarm to robot controllers/PLC/monitoring systems upon fault detection. With no moving parts (sensor), the unit is unaffected by dirty water and will eliminate nuisance tripping. Stand-Alone package reduces installed cost, operating cost minimal and no training required. Rocon Water Control Valve (WCV) prevents leaks and defective welds in the resistance welding process. This is done by shutting off the waterflow to a displaced weld cap. The operator is then made aware of this condition by an electrical signal and optional LED lights.